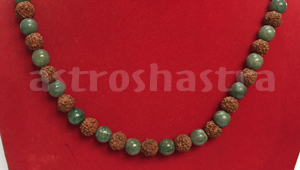 Energised Malas - This Mala is made up of 55 Five mukhi Rudraksh beads and 54 natural round Emerald beads, constituting 108+1 beads mala. 1. 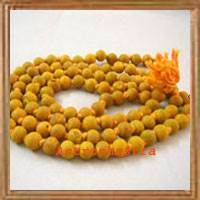 It enhance the power of Planet Mercury for the wearer. 2. It helps to enhance intelligence. 3. It improves grasping power . 4. The emerald is perfect for people trying to make a mark in creative filed like music, painting, fashion designing, interior designing, etc. Emerald is related to planet Mercury hence it helps the wear to get new ideas. They will find themselves way ahead from the competition. 5. It is known as a stone of communication. It helps you to better articulate your thoughts in both written and oral form. 6. It boosts the confidence of the speaker and helps to impress everyone with their words and thoughts. 7. It enhance creativity, artistic talents, linguistic skills and ability to ideate / innovate better. 8. It is a gemstone that can help with speech difficulties, respiratory troubles, allergies and nervous disorders. 9. It enahnce business, can beget great fame and fortune. 10. It takes away emotional toxicity. 11. 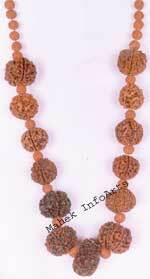 It help in shedding of illusory ideas. 12. It cures the individuals who stammer, or feel shy to interact with others or feel held back due to lack of confidence. 13. Individuals like psychics, healers, astrologers or practitioners of any divine arts can find tremendous progress in their line of work by wearing and emerald. 14. It is quite helpful for people suffering from allergies, skin diseases, respiratory ailments and nervous disorders. 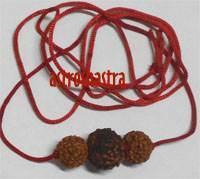 How to wear Rudraksh and Emerald Mala ? 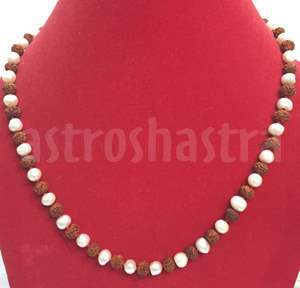 Mantra to Chant “Om namah Shivay' and beej mantra of shukra " Om Braam Breem Broom Sah Budhaye Namah " is the mantra that has to be chanted to wear this Mantra for about 108 times.